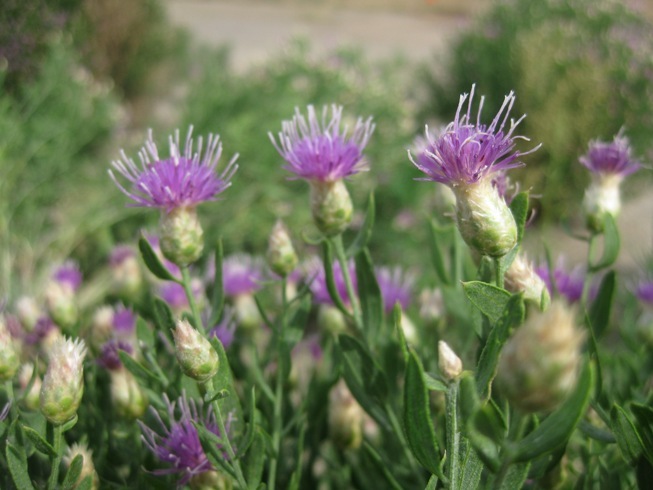 General Description: Russian knapweed is a bushy, branched perennial, reaching 1 to 3 feet tall and forming clones or colonies from vigorous, deep, spreading rhizomes. Flower Description: Many flower heads, pink to purple in color. The outer bracts under the flower heads are greenish to straw colored and have a broad, papery tip. Leaf Description: Leaves at the base of the stem (basal leaves) are gray-green and lobed. Upper stem leaves are smaller with toothed edges or entire (smooth) edges. Stem Description: Stems are upright, branched and hairy. Young plants are whitish and woolly. Fruit/Seed Description: Seeds (achenes) are ivory white and have a feather-like plume (pappus). It is an aggressive invader of pastures, non-crop areas, grain fields and other cultivated fields. In addition, the plant is poisonous to horses, causing chewing disease (equine nigropallidal encephalomalacia). Livestock may avoid this species.